In July 2016, a salvage excavation was conducted at several sites along the streambed of Nahal Yitnan (Permit No. A-7733; map ref. 195577–6827/559334–60334; Fig. 1), prior to construction. 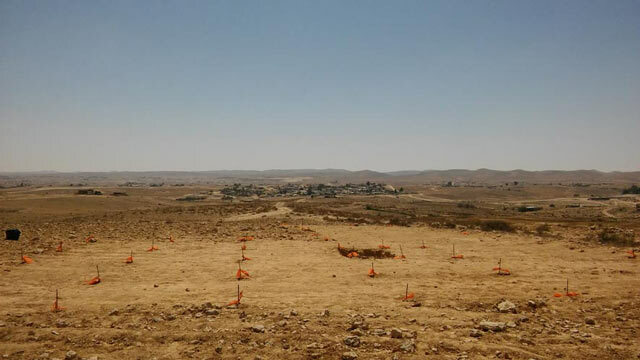 The excavation, undertaken on behalf of the Israel Antiquities Authority and financed by the Ministry of Housing, was directed by M. Oron (photography), with the assistance of Y. Al-ʽAmor (administration), Y. Vardi, M. Pasternak and D. Dagan (area supervision) and M. Kahan (surveying and drafting). Family members, including children, of the Abu-ʽAshiba family participated in the excavation. The excavation was preceded by a development survey performed by D. Yegorov (License No. 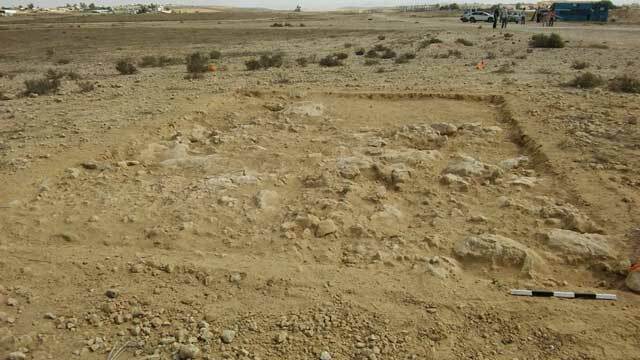 S-552/2015), who identified ten sites (Nahal Yitnan 1–10), mostly scatters of knapped flint items, the remains of two Ottoman-period structures and a well. 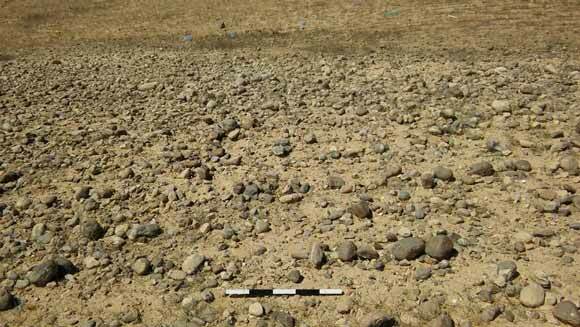 One of the sites (Nahal Yitnan 7) was excavated in 2015 (Yegorov 2017), revealing a knapping site of the Early Bronze Age and a scatter of flint items characteristic of the Mousterian culture of the Middle Paleolithic period. An Early Bronze Age site near the streambed of Nahal Yitnan and within the boundaries of the current project was excavated in 2007, yielding architectural remains, as well as pottery sherds and flint tools typical of this period (Talis 2010). 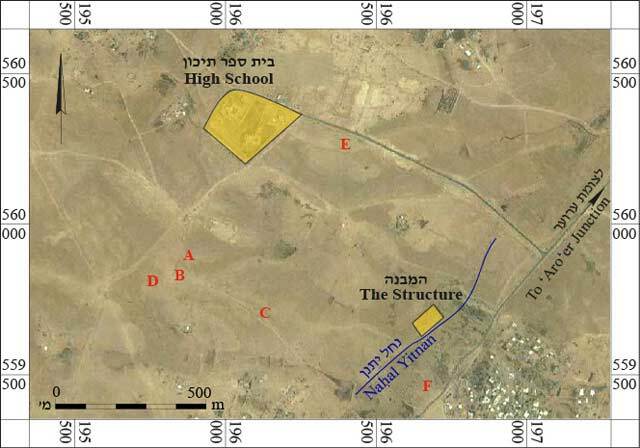 In 2011, another development survey was conducted along Nahal Yitnan, north of the excavation area, in which no ancient remains were discerned (Paran and Sontag 2012). The excavation was conducted in six areas (A–F; Fig. 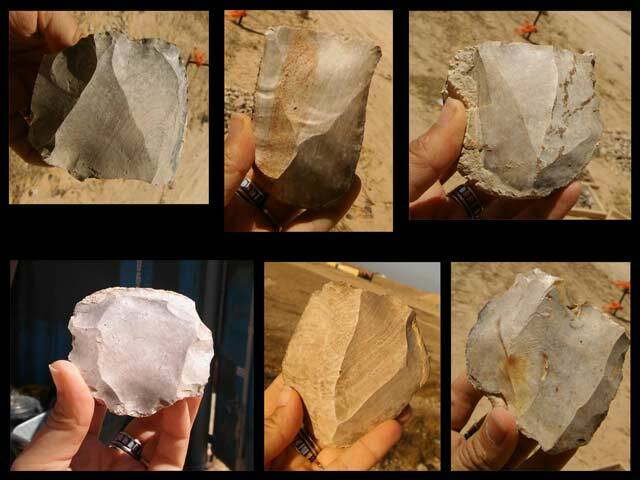 2), in which five prehistoric sites (Nahal Yitnan 3, 6, 8–10) with evidence of flint knapping were identified. The finds were dated to several periods, particularly the Middle Paleolithic and Chalcolithic periods. 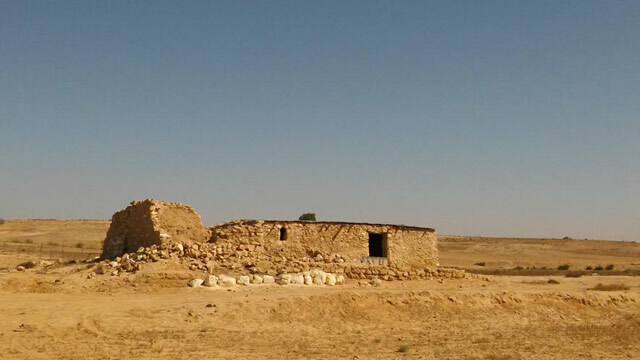 In addition, an Ottoman-period building (Nahal Yitnan 1) constructed near the Nahal Yitnan streambed was documented, but not excavated; it is slated for conservation. The sites are located on moderate hills along the Nahal Yitnan streambed—one of the tributaries of Nahal Be’er Shevaʽ. The hills delineate the Be’er Shevaʽ Valley on the south and are characterized by sediments of the Hazeva formation, chalk of the ʽAdullam formation and outcrops of clay conglomerate generally composed of sand and striped flint pebbles suitable for knapping (see Wdowinski, Sneh and Avni 2012; Fig. 3). It is apparent that the knapping sites were all located near these outcrops of flint pebbles, which served as an available raw material. The excavation areas (with grids of 2 × 2 m squares), are hereby described in the order they were designated, in accordance with the order of their excavation. 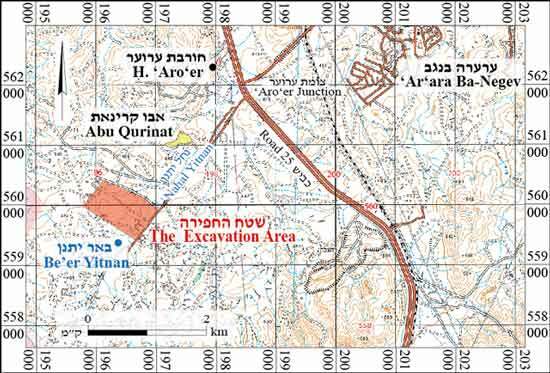 Areas A and B (Nahal Yitnan 6). Flint Levallois items, characteristic of the Mousterian culture of the Middle Paleolithic period, were discerned on the surface in a plowed field on a gentle slope of a hill. Seeking to examine the flint scatter and its extent, as well as collect a representative assemblage of the flint items, 55 squares were opened in two areas: in the north (A) and south (B; Fig. 4) of the site. In most of the squares items were gathered from the surface (depth c. 0.1 m), but in several squares shallow probes were opened (depth 0.3–0.5 m), down to the hard calcrete (Fig. 5). The probes indicated that there was no archaeological stratum in situ, and that the knapped artifacts lay near the present-day surface. Nevertheless, the collected flint assemblage is homogeneous, both technologically and typologically, and includes small flint chips, evidence that it did not undergo significant erosion. 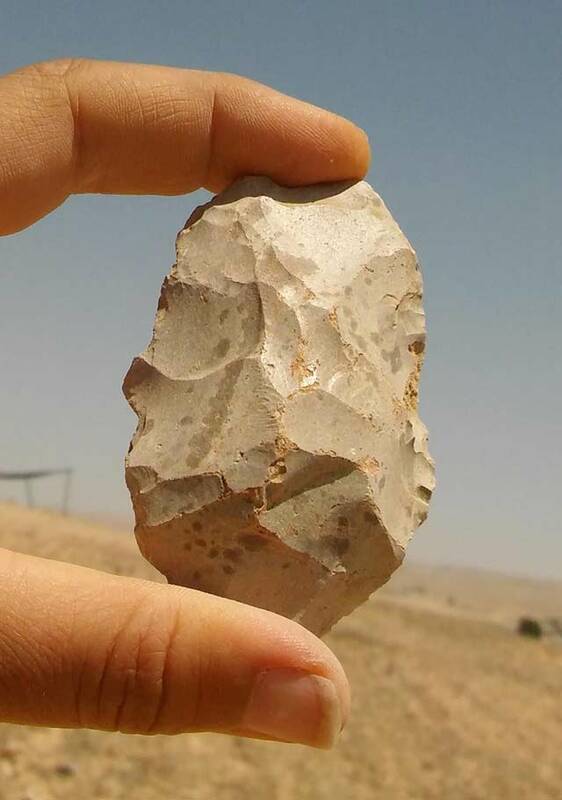 The assemblage can therefore provide a valuable contribution to the study of the Mousterian flint industry at the site, revealing its characteristics in this region of the Negev. Area C (Nahal Yitnan 8). The site was exposed at the top of a gentle hill overlooking the Nahal Yitnan streambed to the east. A flint scatter was discerned nearby a large outcrop of natural flint pebbles that served as a source of raw material for knapping. Ten squares were opened where the flint density was the greatest. Flint items were collected from the surface and from the excavation (depth c. 0.2 m). A deep probe conducted in one of the squares showed that the archaeological accumulation was only in the upper part of the square, above a layer of hard calcrete. A preliminary examination of the flint assemblage shows that this is a well-preserved knapping site that has not been significantly eroded, and which can probably be dated to the Chalcolithic period. The composition of the assemblage, comprising numerous cortical items, chips and cores, as well as several tools and target items, is characteristic of an industrial site where only the preliminary knapping took place. Other than several items belonging to the Mousterian culture, which seem to have originated at the Nahal Yitnan 6 site, the assemblage is homogeneous and rather well-preserved. Area D (Nahal Yitnan 3). The site was exposed on a hilltop, where a scatter of knapped flint was found. Situated near Nahal Yitnan 6, it seems that one outcrop of flint pebbles was used as raw material at both knapping locations. As in Site 8, the calcrete bedrock was very high here, with practically no overlying topsoil (Fig. 6); thus, the flint assemblage was found mostly on the surface. Six squares were excavated down to the bedrock (depth 0.15 m); flint was collected from the surface in nine additional squares. The flint assemblage was well-preserved, but a preliminary examination did not reveal any diagnostic items that allow us to clearly identify its cultural affinity or chronology. The numerous bladelet cores in the assemblage can be ascribed to the Chalcolithic period, as well as to earlier periods, such as the Epipaleolithic period. The restoration of two flint flakes in the initial sorting of the assemblage indicates that the assemblage did not suffer from any significant erosion. Area E (Nahal Yitnan 9). A layer of natural flint pebbles was exposed on the western and southern slopes of a moderate hill. Flint items, the best-preserved in the excavated areas, were found on the surface at the top of the hill. It was apparent that mechanical equipment had been at work there, leveling the upper part of the hill, thereby exposing a layer of well-preserved flaked flint and damaging an archaeological layer. Fourteen squares were opened on the western slope and the hilltop. The excavation revealed that the flint artifacts on the western slope were poorly preserved, belonged mainly to the Mousterian culture and found only on surface. However, it was evident that the squares at top of the hill yielded an in situ archaeological stratum (thickness 0.2–0.3 m) that had been damaged by modern activity and included a repertoire of well-preserved knapped flint. The assemblage is clearly a flake-production industry, involving mainly the removal of the calcareous cortex from the flint nodules; it is thus difficult to characterize it culturally. However, it includes bladelet cores and bifacial tools (Fig. 7) which suggest that the assemblage dates from the Chalcolithic period. Hard calcrete was revealed beneath this layer (Fig. 8). On the surface, the later flake industry is mixed with items from the Middle Paleolithic period. Diagnostic flint artifacts, mostly Levallois cores of the Middle Paleolithic period (Fig. 9), were gathered; these, along with the other assemblages from this period, add to our understanding of the technology in the region. A hand axe from the Lower Paleolithic period (1,500,000–250,000 YBP) was also collected; its initial deposition is unknown, but it attests to human presence in the region during this early period. A few non-diagnostic pottery sherds were also found at the top of the hill. Area F (Nahal Yitnan 10). 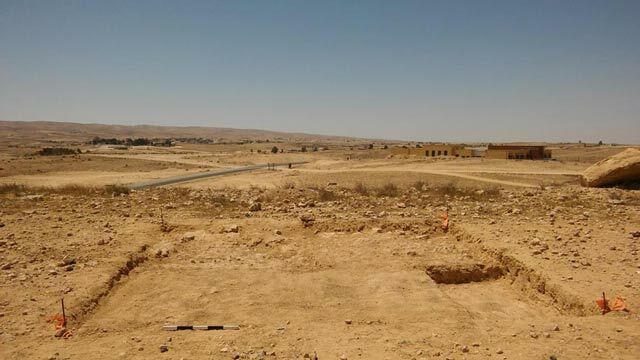 A low density of knapped flint items was found on the surface east of the Nahal Yitnan streambed and adjacent to the road, a gas pipeline and intensive modern construction. Three squares were opened, in which only a few poorly preserved flint artifacts were noted. It seems that the flint was swept there from an unknown source, possibly from the hills to the east. The flint was not homogeneous and cannot be attributed to any cultural or chronological entity. 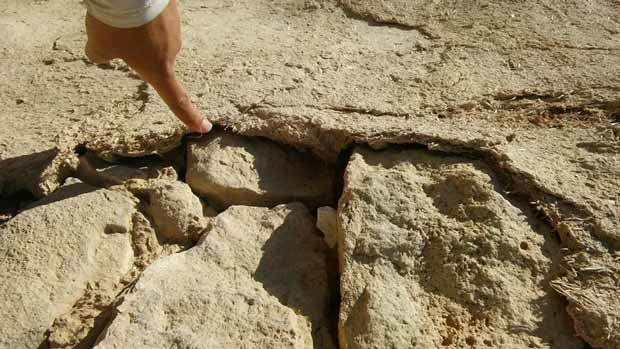 Nahal Yitnan 1 (no excavation was conducted; conservation work may be carried out at the site). An Ottoman-period building constructed of mudbricks and stones was documented. The building was used until recently and was even renovated by its inhabitants. It consists of four rooms (wall thickness 0.5–0.6 m; Figs. 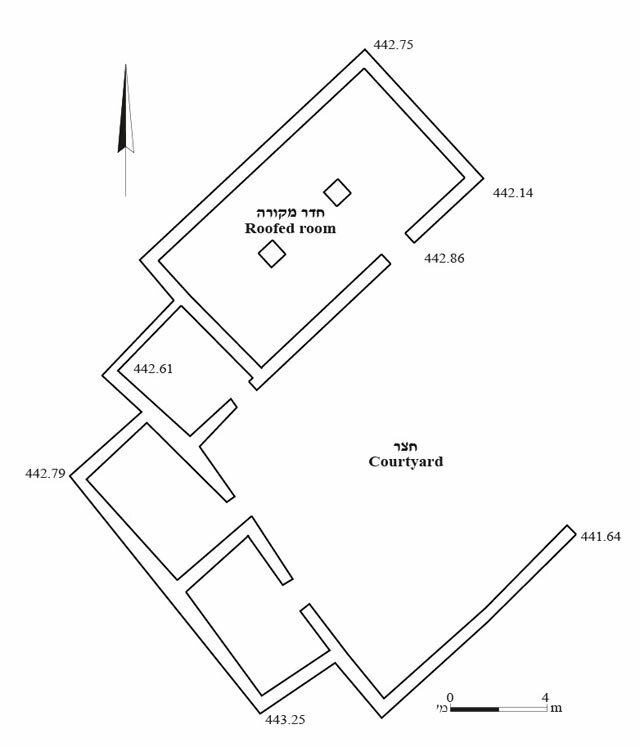 10, 11) arranged around a central courtyard, whose perimeter wall is preserved only on its southeastern side. All the doorways (width 0.6–0.8 m) face the courtyard. On the northwestern side of the courtyard is a large room (6.5 × 12.0 m) with two square columns (0.9 × 0.9 m) that support a roof (which is currently made of sheet metal). One room (2.0 × 2.5 m) is located just to the southwest of the space, and two other rooms (each 2.0 × 3.5 m) are built side-by-side on the southwestern side of the courtyard. In several of the rooms were remains of plaster that covered the walls (Fig. 12). 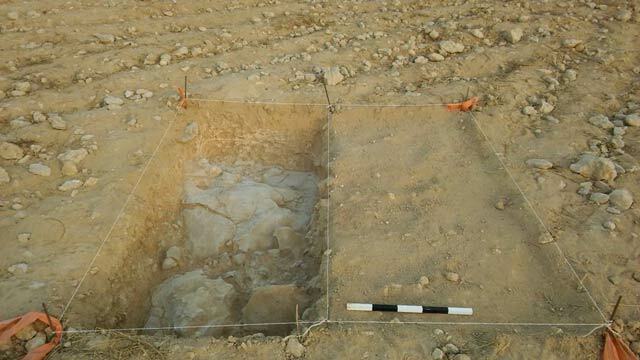 The excavation finds are evidence of intensive human activity in the Nahal Yitnan region during the Middle Paleolithic and Chalcolithic periods, probably due to geological outcrops of flint pebbles that served as a source of raw material. The sites dating from these periods were probably industrial/knapping sites that were briefly visited for collecting raw material from the outcrop. Preliminary knapping—the removal of the pebbles’ calcareous cortex—was done at the site; at times, the cores were shaped to produce target items, from which tools were produced. These items were probably taken from the sites, since they are hardly present in the assemblages. It is likely that similar activity took place in this area during the Lower Paleolithic period as well; however, the weathering processes did not leave any evidence of this, save for the hand axe found at Site 9. Two wells—Yitnan and ʽAroʽer—which are adjacent to Nahal Yitnan, indicate that the groundwater was high in the region, and that during some of the prehistoric periods there were springs in the area, which served as a source of water and enabled human activity. Talis S. 2010. Nahal Yitnan. Abu-Qurinat. HA-ESI 122. Wdowinski S., Sneh A. and Avni Y. 2012. Geological Map of Israel 1:50,000: Tel Malhata, Sheet 15-III (Partially revised 2016). Jerusalem. Yegorov D. 2017. Nahal Yitnan. HA-ESI 129. 2. Location of excavation areas. 3. An outcrop of flint pebbles in Area E (Nahal Yitnan 9), looking south. 4. Area A (Nahal Yitnan 6), looking east. 5. The calcrete layer in Area A, looking east. 6. Area D (Nahal Yitnan 3), looking north. 7. A bifacial tool from Area E (Nahal Yitnan 9). 8. The top of the hill in Area E (Nahal Yitnan 9), looking south. 9. Levallois cores from Area E (Nahal Yitnan 9). 11. The building, looking west. 12. A section of mud-plaster.